On the eve of the Australian Open Finals this week, a tournament filled with many upsets and surprises (particularly Serena Williams’s unbelievable meltdown), I find myself reaching back through the lens of time to my early beginnings in the sport. Tennis runs in the family: my uncle was a tennis champion who played at Wimbledon, toured Europe, and even played with the King of Sweden, my brother played in college and gave me my first tennis racquet, a Wilson wood Jack Kramer, slightly warped in the frame, with yellow gut strings, and as luck would have it, I’m married to a wonderful woman who’s a talented tennis player, a tournament winner with many trophies to her credit. All the usual cliches apply. Tennis is truly a sport of a lifetime. Yes. Tennis players marry other tennis players. Yes. Tennis players all get tennis elbow, eventually (as I did a good three, painful times, to the point of not even being able to brush my teeth). Tennis players, as my coach at Dartmouth told us when I played on the team, are artists, pure and simple. A wild and wacky breed of athlete, a craftsman on court. 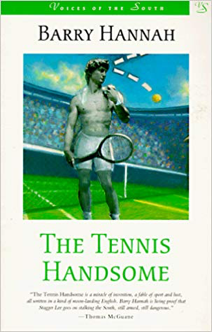 Tennis players are, for the most part, handsome, as Barry Hannah depicted in his novel, The Tennis Handsome, in 1983. For me, I picked up on the sport when I turned eleven, hoping to improve hitting baseballs in Little League by banging tennis balls against a cement wall. Soon I fell in love with the sport: you could not keep me away from it. By the time I was thirteen I was playing local junior tournaments in Ohio. At sixteen, I was a junior champion, and at seventeen I played in the state tennis championships in Columbus, losing in the quarters, although in a hard-fought three set battle. My high school coach Tom Meinhardt was a true inspiration, a mentor, and a great man who got me over the top. I owe him a lot. Dartmouth was another story: long, cold winters without indoor courts; snow on the ground till May, but still my passion for the game persisted, as I had great coaching and great teammates, like Charlie Hoeveler, Corky Stewart, Curt Anderson, Bill Kirkpatrick, Tucky Mays, to name a few. For a summer in Ohio, I started a tennis program at Forest Hill Park and was stunned to see over two hundred kids show up to learn the basics. Something had been awakened in the community, and my passion for the sport became infectious, spreading to a younger generation. Beyond Dartmouth, I taught tennis for two summers at a tennis club in Wilkes-Barre, Pennsylvania, with twelve beautiful hard-tru courts, ran my own tennis shop, strung racquets and sold them, taught juniors, moms, dads, and found a wonderful family, the Dorans, who put me up in an attic room of their house and fed me during my demanding tour of duty at the club when I taught from nine in the morning to nine at night. In Europe, I played tournaments, traveled, mastered the quirks of gritty red clay (which was more to my liking because I didn’t have a big serve), and made many friends in the ranks. The sport had been good to me in life and I was hoping, if I somehow could, to find a way to give back. 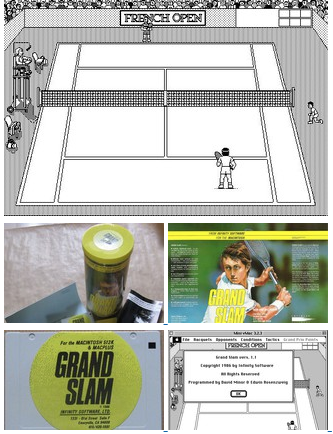 In California, not long after Steve Jobs introduced the first Macintosh 128K computer, I started my software company, Infinity Software, Ltd., and launched the first tennis game stimulation for the Mac: Grand Slam Tennis. You used the mouse to control the action: stroking the ball against four different opponents, playing the French on clay (where the balls bounced higher and you could slide on the surface), Wimbledon and Australian on grass, and the US Open on hardcourts. 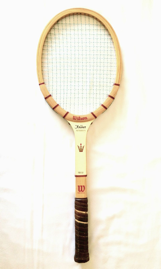 You could adjust racquet tension and the speed of the rallies. I had the good luck of working with two awesome programmers to develop the game and bring it market. The beauty of the game is that you can forever tweak your strokes, adding topspin, if you like, to your backhand or fine-tuning your volley at net so it’s got more sting, or improving your overhead smash with a scissors kick, quicker lateral movement, and the ball toss for your serve, which will always need adjustments with age and physical conditioning. I also like the idea of combining gut and nylon for your strings (as I do), which helps control your groundstrokes. Interestingly, although these may seem like new ideas, I saw them in practice when I studied the greats of the game on tour in Ohio up close, courtside, only feet away, observing their every move and habit: Pancho Gonzales, Lew Hoad, Ken Rosewall, Rod Laver, Newcombe and Roche in doubles, among others. Gonzales was relentless in his pursuit of fine-tuning his game, which included adjusting the tension of his racquet strings, playing with wood, then metal, then composite, and at times, the taping of his fingers before playing (oh, those nasty blisters!). Those memories of the tour in the sixties, before the days of Open Tennis, before the modern era that we now take for granted, are deeply etched in consciousness. My wife and I still play, though not as often as we’d like to because of injuries, and my backhand, which I modeled after Ken Rosewall, still continues to work like a charm when I hit the ball down the line. The rewards of the game are still there, the pure pleasure of connecting with the ball, hitting a shot crosscourt or down the line, whacking an occasional ace or a sharp volley at net. At one point I was going to write a novel about tennis, but gave up after a couple of drafts. I couldn’t get the story right. Maybe one day I will.